Before Prince and before Madonna, there was a mononymous entertainer known as much for his showmanship, ambivalent sexuality and costumes as he was for his crowd-pleasing music and massive commercial success. Władziu Valentino Liberace was the Wisconsin born immigrant son who - treading a fine line between flamboyance and outrageousness - made his name huge and glittery through four decades of music, performances and TV and film appearances. Steven Soderbergh’s latest last film Behind the Candelabra - financed by HBO but receiving a theatrical release in the UK and the rest of Europe - tells the story of the latter part of his career and more specifically his relationship with Scott Thorson (Matt Damon), his lover, friend and chauffeur. Damon is perfect in the role of Thorson, the hearty outdoor lad with dreams of being a vet who finds himself inveigled into the world of showbiz and munificence. He is literally dazzled by his surroundings and the attention and gifts Liberace (Michael Douglas) bestows on his young protégé. Scott’s initial qualms give way under Liberace’s (or Lee as he prefers to be known) charm offensive and generosity. Soderbergh and screenwriter Richard LaGravenese, adapting Thorson’s own book, are good at showing the intimacy and domesticity that only gradually gives way to a more sinister Svengali-like need to control and dominate. 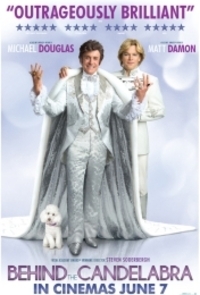 This is no simple morality tale, however, and Michael Douglas gives his Liberace a wit and canniness that means the performance, whilst always being a performance, never slips into mere parody. Douglas is magnificent as the peacock-imitating, ivory-tinkling showman, enthralling his audience with his “faaaaaaabulous” self-confidence, his wit, and his virtuoso piano playing. On first catching the show, Scott is flabbergasted that the audience appear utterly ignorant of Liberace’s homosexuality, and there is a constant underlying tension and danger as Lee attempts to negotiate his own rampant libido with the need for Liberace to maintain a hold on the affections of the housewives of Middle America. There is flint underneath the feathers, but there are still feathers. Douglas and Damon are supported by an almost unrecognisable supporting cast. Scott Bakula plays Scott’s lover who introduces him to Lee. Dan Aykroyd has a wonderful comic turn as Liberace’s attack dog manager, Seymour Heller, and Debbie Reynolds - who incidentally was herself represented in her heyday by the real life Heller - plays Frances, Liberace’s beloved (or perhaps not that beloved) mother. Topping them all, however, is a scene-stealing Rob Lowe, who plays the squeaky faced plastic surgeon who oversees Scott’s transformation into a younger version of Liberace. With small reptilian eyes glittering from behind an increasingly mask-like face, Lowe gets some of the film’s best lines as he edges Scott towards a diet called the California regime - consisting of a variety of different coloured pills - while assuring him that it is all totally healthy and without danger. Although there is nothing new in the film’s approach - the rags to flares and back again path was trod recently by Paul Thomas Anderson’s Boogie Nights (1997) - Behind the Candelabra earns its place through the quality of its performances and its pitch perfect tone. Soderbergh’s film is both a gay love story and a meditation on fame, but most of all it is an expertly crafted piece of entertainment, fittingly distributed under the aegis of the new home of popular American storytelling, HBO. It will have many regretting Soderbergh’s imminent sabbatical. This review was published on June 07, 2013.